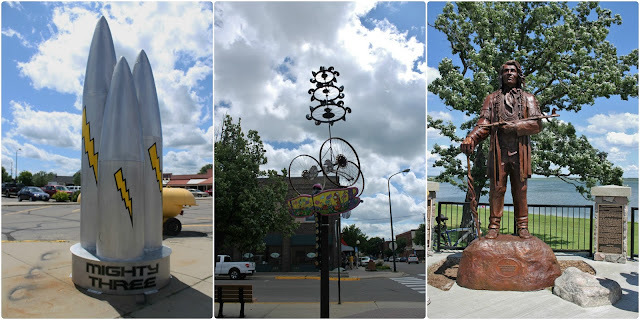 We traveled to Bemidji, MN on July 15th. This trip was only about 2 hours and we had nice weather all the way - such a change from the last few moves. Bemidji makes Nancy think of Jumanji and she gave Les strict instructions that if he heard a heart beat coming from a box he could not open it. We stayed at the Royal Oak RV Park, which is right on Hwy 2, so there was a bit of traffic noise. It was so hot we had our air conditioning on and couldn't hear it inside, but wouldn't want to be in a tent. The sites were a little on the small size and the grounds weren't unkempt but not the neatest we have been at. There were a number of permanent trailers and most of those lots were not kept up very well. The laundry room and bathrooms were clean. There was a trail through the trees which was a nice place for walking the dog. This wasn't one of our more favorite places. There were signs up to keep your dog on a leash, yet the owners dog ran free, pooped on our site and the ladies next to us had an older rather feeble dog that was being driven crazy by the owners dog. Wouldn't go back to this one. Deluth is a very cool town. Once again another place that would be awesome to live in except for the winter months. We made a few stops on our way east. 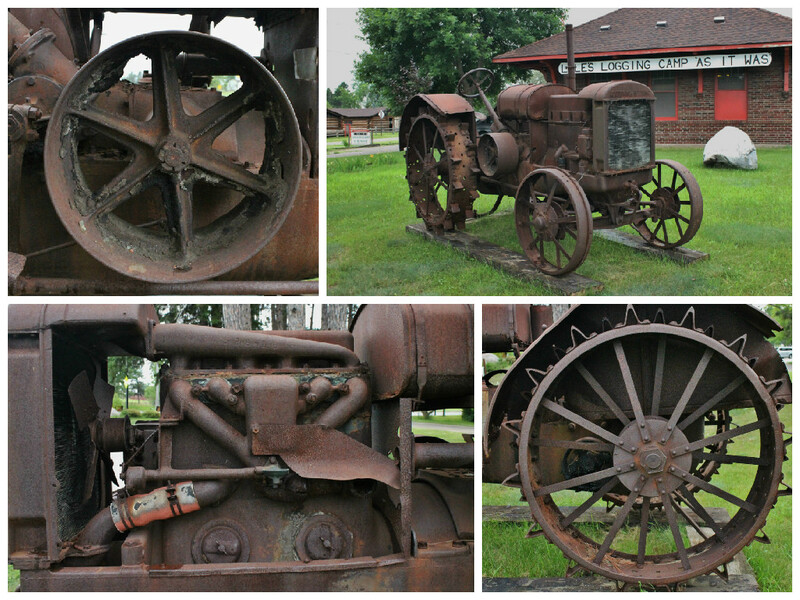 Lyle's Logging Camp in Cass Lake was the first. 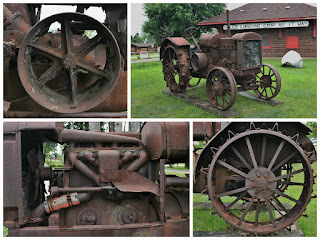 Found a lovely rusted logging tractor. The second stop was in Grand Rapids, between Cass Lake and Grand Rapids we thought we were back in Michigan. 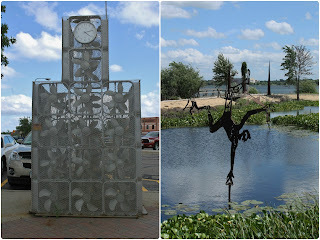 Grand Rapids is a fairly large town, and the childhood home of Judy Garland. 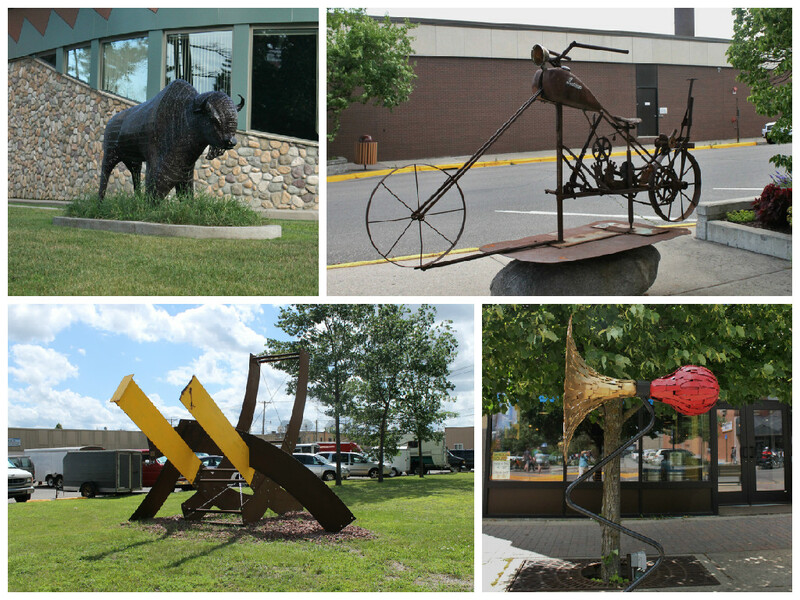 It is also home to a interesting Metal Moose and Paul Bunyan's Adirondack Chair. When we finally made it to Deluth we drove past Bob Dylan's boyhood home, he lived here until he was six years old and then moved to Hibbing, MN. 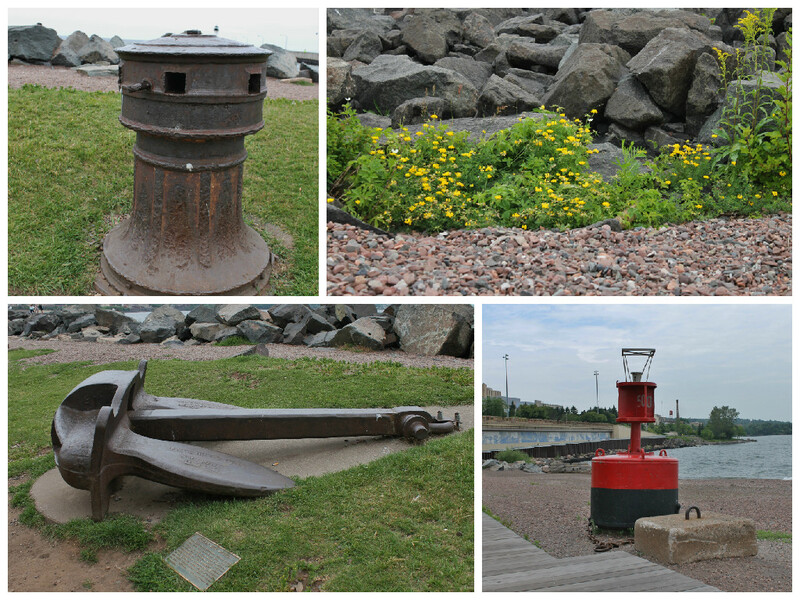 We spent a couple of hours exploring the Downtown Lakewalk. There are two lighthouses, one on each side of the river that runs under the Aerial Lift Bridge, coming in from Lake Superior. This bridge was built in 1905 and upgraded in 1930 to a vertical lift bridge, which is rather uncommon. It was added to the National Historic Register in 1973. They have a wooden boardwalk that runs a couple of miles and also a paved walkway for bikes. You can rent four or six seat bikes for just $13 an hour, we saw a ton of people on them. There are benches all along the boardwalk to rest and watch the water, there is a rocky beach and a sand beach. 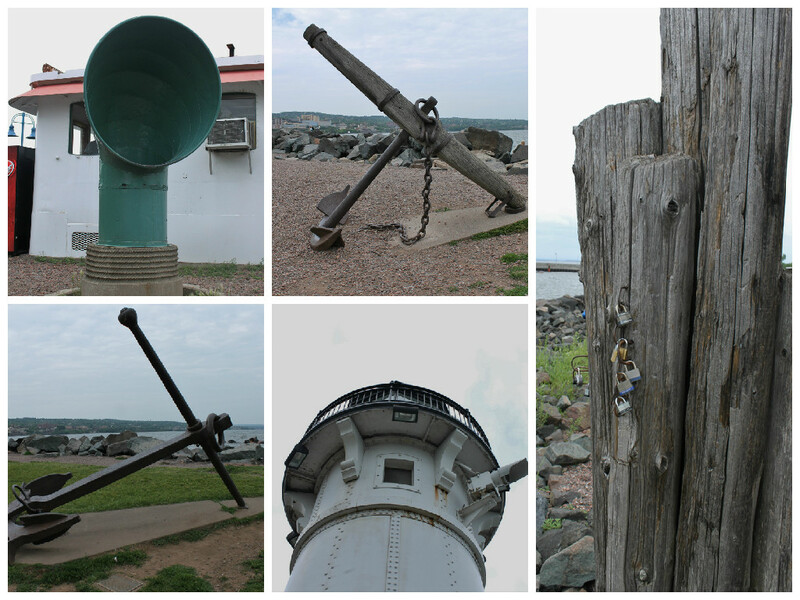 Interesting nautical artifacts are positioned along the way. Restaurants, food trucks, breweries, hotels and shops are all just footsteps away. 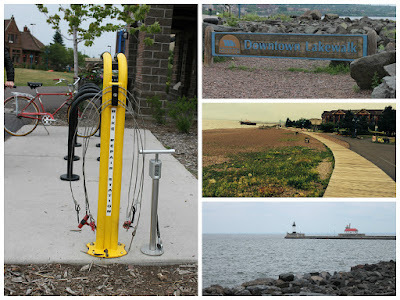 The bike repair station made us think of our friend Janet McAfee. There was an old building just off shore - it was once a loading dock for iron ore ships, or that was the hope of the man who built it. Unfortunately he discovered ships couldn't be loaded from a stationary dock very well and he had to close up shop. 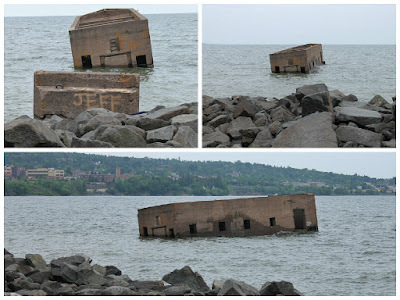 It appears our nephew Jeff may had been here before us! On our quest to find another Peter Toth Indian we traveled to Two Harbors, MN. 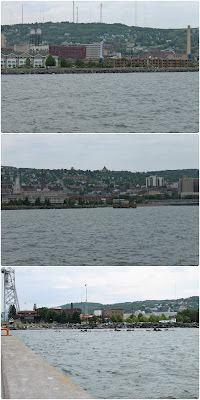 We followed the Lake Superior shore line north to get there. 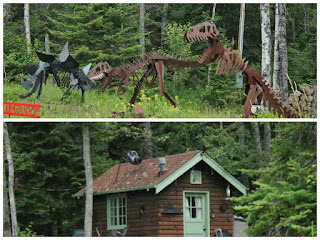 On our way, we found a few Roadside Oddities and we saw our first eagle on this trip. 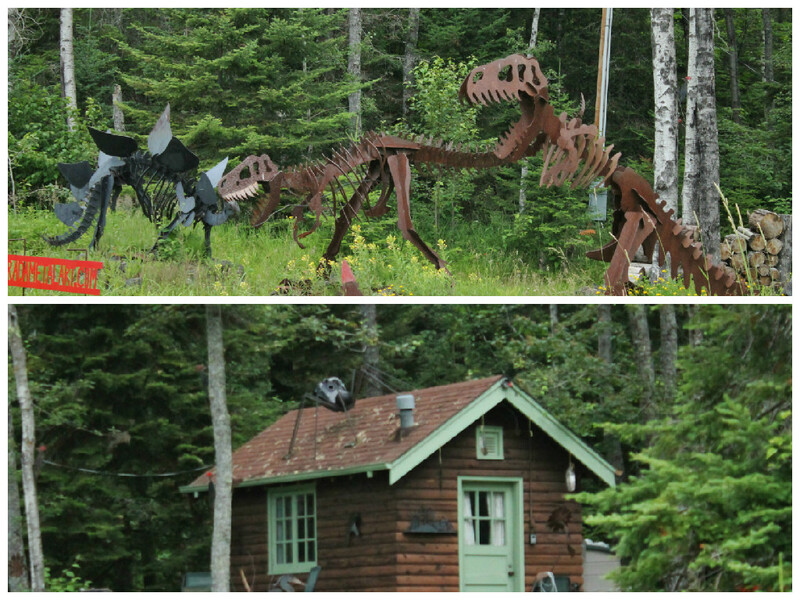 We spotted metal dinosaurs and spiders, along with Pantless Pete, yes that really is his name! This Peter Toth's Indian was carved in 1977 out of pine and is the 25th stature he carved. 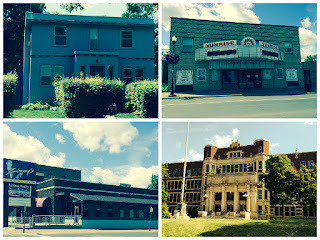 After finding the Indian we explored the town. It is a small town, but it has a number of restaurants and some shops. We of course went to the lighthouse, which is now a bed and breakfast, and while there we came upon these large ore loading docks, which at first we thought was a ship building site. There is also a train museum and a tug boat you can tour. This day ended with the most amazing sunset we have ever seen. On a quest for more Bob Dylan places we headed to Hibbing, MN, where his family moved to when he was six. His birth name was Robert Zimmerman and his grandparents owned many businesses in Hibbing, including Zimmy's Restaurant and a theater. The restaurant has recently closed and the theater is now a deli. 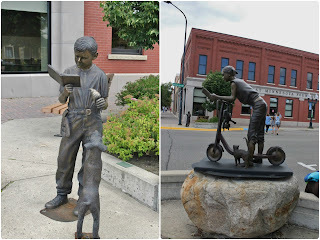 We saw the home he grew up in, his high school and an exhibit at the public library that included a paper-mache statue of him. 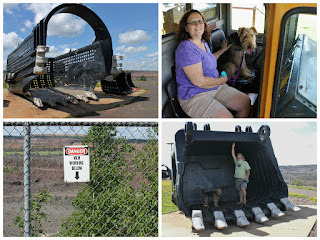 While in Hibbing we went to the Rust-Ore Mine Overlook, they have a viewing area that overlooks the mine. It was rather strange that such destruction of the earth could be so pretty. You can climb up into a very large truck, think gargantuan Tonka truck. They have historical and information signs throughout the area and other equipment that is used in mining. Downtown Bemidji is a happening little place. There is a university here, which always seems to make a difference in what a town offers. 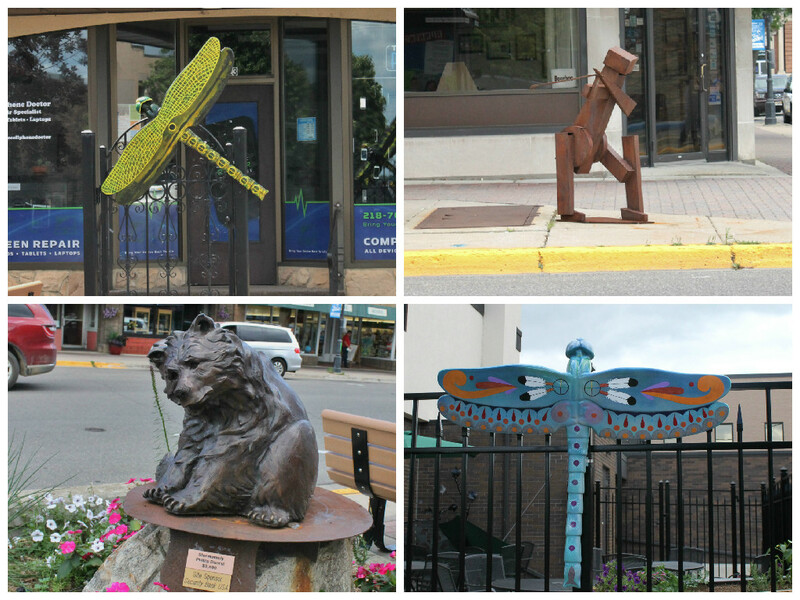 They have lots of stores and restaurants and even a craft brewery, and on the out skirts of town you can find every major store that you might need, so you have a small town feel with the convenience of a large town. The day we explored there was an art fair going on so of course we had to check it out. 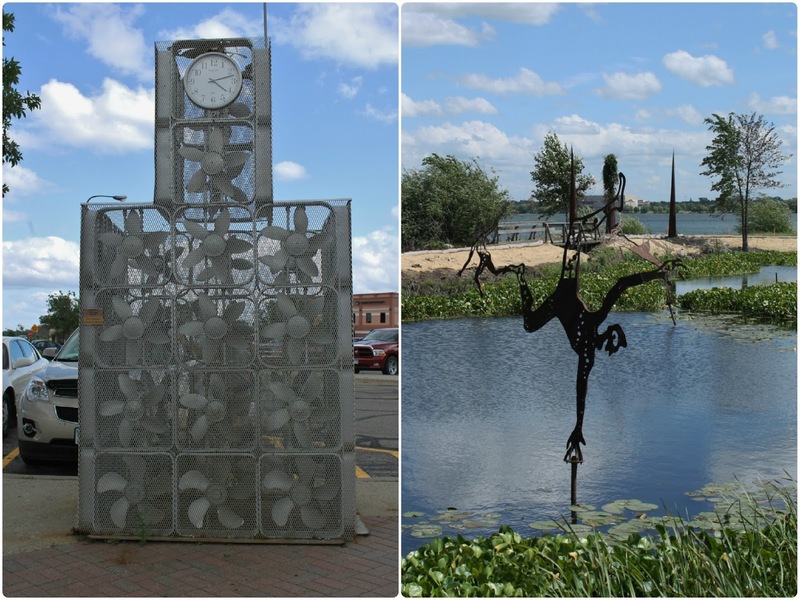 Some really great art, mostly local, but there were a few there that we saw at the Minneapolis Art Fair. 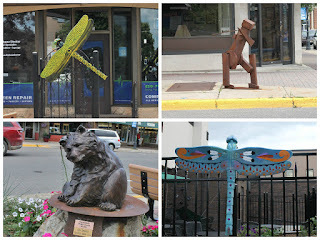 There are art sculptures lining the streets. 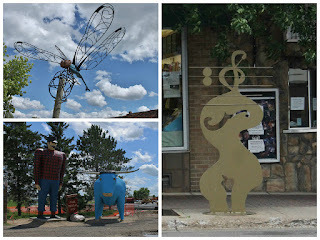 Missiles, a yellow submarine, motorcycle, music related art, of course Paul and Babe, insects, and more. Nancy's favorites were the boy and girl reading a book. While enjoying a sampling of beer at the Bemidji Brewery, we met Deb, who is a local and a proud American Indian. She regaled us with stories of local lore and had us laughing so hard. Would have loved to spend more time with her. This is one of the best part of our travels, meeting people and hearing their stories. 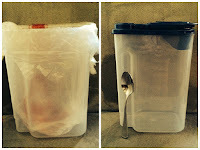 ~ When living in a small space you have to sometimes think outside the box for solutions to every day needs. While our bathroom is a fairly good size it doesn't have much floor space so a regular wastebasket just didn't fit. Looked at camping stores for small ones and they wanted $15 for them. So went to the dollar store and bought a small plastic pitcher and it works perfect.